After Virtue is a book title that is descriptive of the time in which we live. In our day, “The language of morality is in [a] … state of grave disorder,” writes Alasdair MacIntyre. In other words, we live in a time beyond virtue—a time when moral judgments have been reduced to attitudes or feelings that can be considered neither true or false. Interestingly, the loss of virtue and objective morality in the broader culture has been paralleled by a lack of discussion of virtue in the Church. 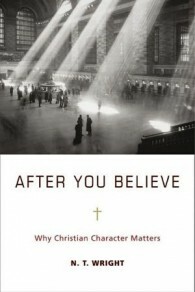 N. T. Wright seeks to correct this deficit in After You Believe: Why Christian Character Matters. Wright goes on to explain that the bridge across this divide is character, which is built by cultivating various virtues under the guidance of and by the power of the Holy Spirit. [W]hat we’re “here for” is to become genuine human beings, reflecting the God in whose image we’re made, and doing so in worship on the one hand and in mission, in its full and large sense, on the other; and that we do this not least by “following Jesus.” The way this works out is that it produces, through the work of the Holy Spirit, a transformation of character. This transformation will mean that we do indeed “keep the rules”—though not out of a sense of externally imposed “duty,” but out of the character that has been formed within us. And it will mean that we do indeed “follow our hearts” and live “authentically”—but only when, with that transformed character fully operative, the hard work up front bears fruit in spontaneous decisions and actions that reflect what has been formed deep within. And, in the wider world, the challenge we face is to grow and develop a fresh generation of leaders, in all walks of life, whose character has been formed in wisdom and public service, not in greed for money or power. The heart of it—the central thing that is supposed to happen “after you believe”—is thus the transformation of character. These quotes are taken from N. T. Wright’s After You Believe: Why Christian Character Matters and from “What to Do After You Believe,” an excerpt that was published in Relevant Magazine.